Departures and Returns, Sandra Brownlee is a limited edition hand sewn paperback catalogue conceived and produced by Sandra Brownlee and Sarah Bodine of San Serif Studio in conjunction with the solo exhibition Departures and Returns, Sandra Brownlee held at the Mary Black Gallery, Halifax, NS in 2009. Copyright 2009 Sandra Brownlee and Nova Scotia Centre for Craft and Design, the catalogue was originally printed in an edition of 100. 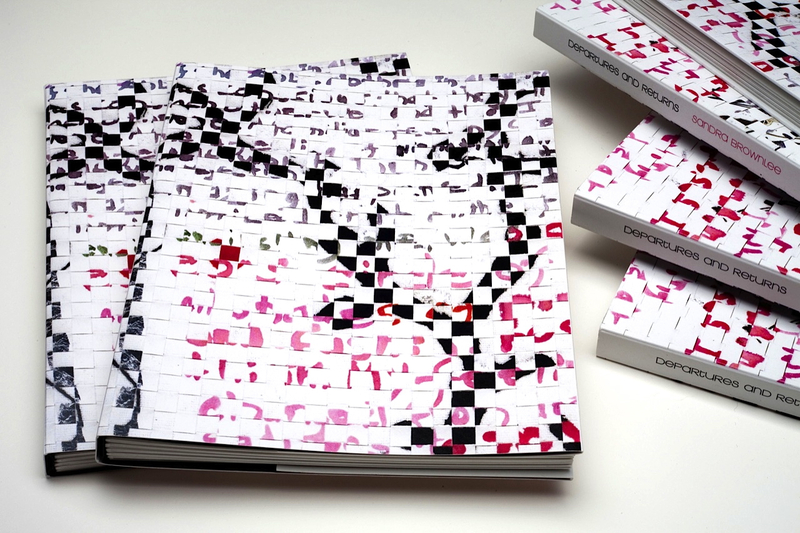 The second printing is in an edition of 200. 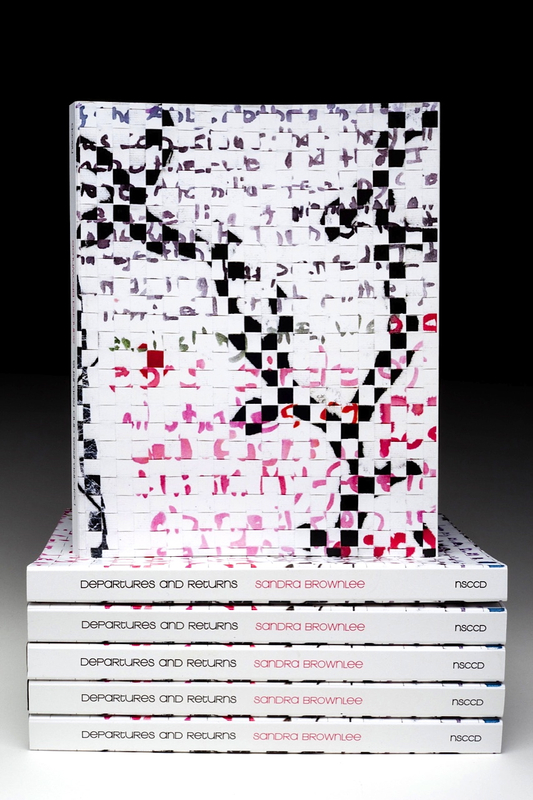 This catalogue contains images and writings about the work exhibited in Departures and Returns. Departures and Returns is about coming home to Nova Scotia and returning to intense, immersive studio work after a long time gone. It is about the changes and evolutions that occurred after thirty years of making work away, and the familiar return of coming home. 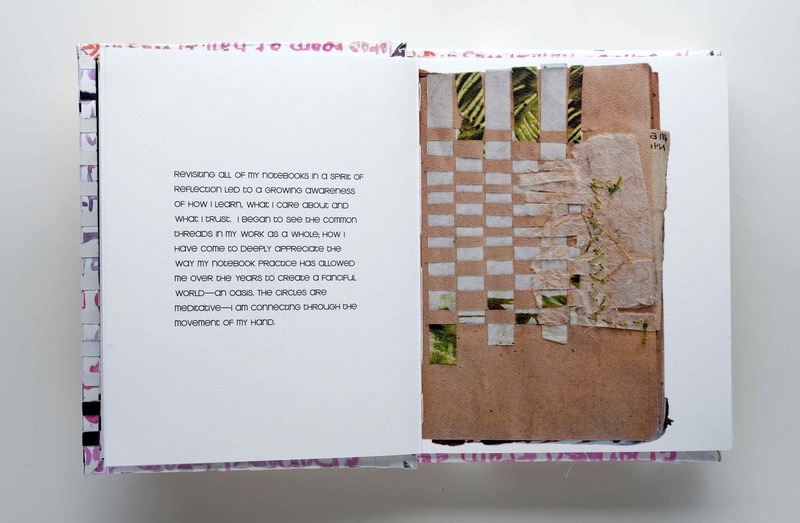 This catalogue contains images of tactile notebooks, weavings, outdoor pieces and writings. 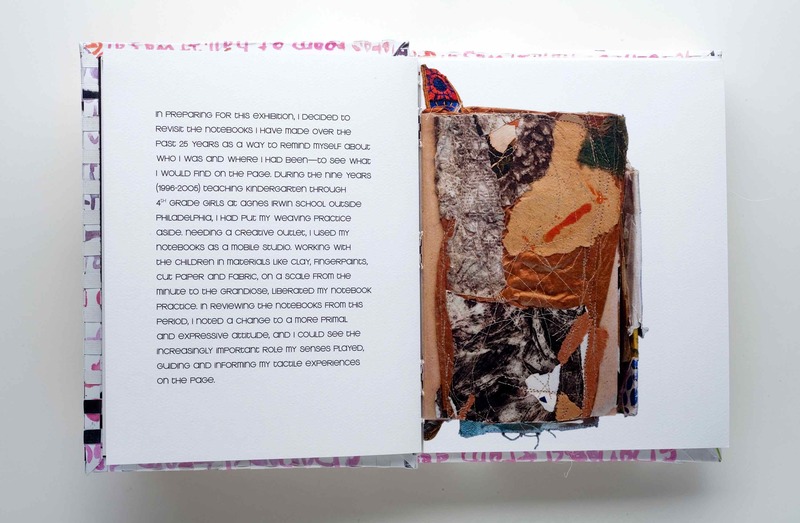 The notebooks operated as portable studio space for expression not merely on paper but in numerous different materials, creating the tactile element of the notebooks. The weaving were created through intuition and improvisation, allowing one line of thread to inform the next. The outdoor spaces are for finding peace and building something permanent and tangible. Through the writings I reflect on and revisit my past work and generate a foundation for the future. Sandra Brownlee is an artist based in Dartmouth, Nova Scotia, where she pursues her ongoing interests in weaving, tactile notebook keeping, and teaching. She has has exhibited her work extensively in both solo and group exhibitions since the late 1970’s. Recent exhibitions include a solo exhibition at the David Kaye Gallery in Toronto, GGVMA Award exhibition at the National Gallery of Canada, Innovators and Legends, Generations in Textiles and Fibers, organized by the Muskegon Museum of Art and most recently, in situ, an invitational group exhibition in South Australia. 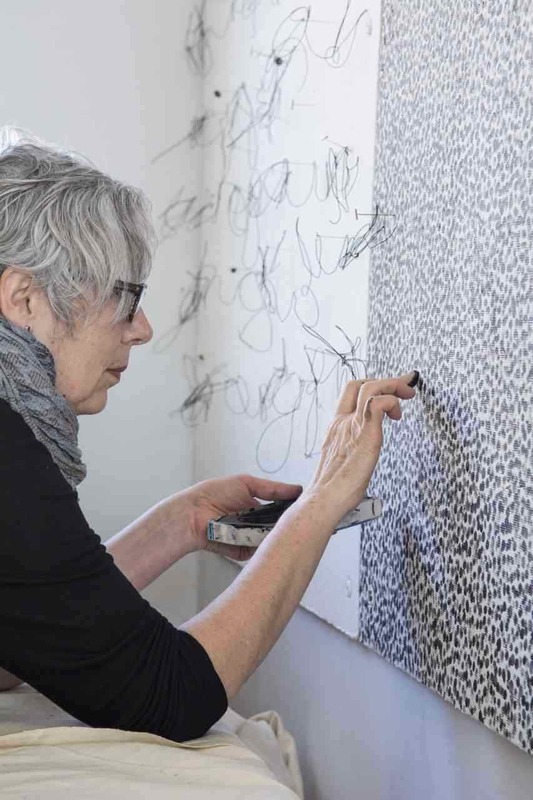 Sandra Brownlee earned her MFA in Fibers from Cranbrook Academy of Art, Bloomfield Hills, Michigan and her BFA from the Nova Scotia College of Art and Design University, Halifax, Nova Scotia. She has received numerous awards including the 2014 Governor General Visual and Media Arts Saidye Bronfman Award, a Canada Council B Grant, and a Pew Fellowship in the Arts. Her work is in numerous public collections including the Nova Scotia Art Bank, The Canada Council Art Bank, and the Canadian Museum of History. IOTA/MB: You speak about stitching as a way to connect with a sensorial experience, often counting stitches as a way to ease anxiety about a task or “make sense” of something. Can you write about the power of the single stitch, and what it can represent in your work? SB: I don’t count each stitch but with each stitch, I am brought back to the present moment. As I stitch, the needle, the thread, the cloth is all consuming and I become more aware of their physical qualities, their beauty. For me, stitching and weaving are a form of tactile meditation and the labour involved liberates my mind and I can think clearly and access what I know. IOTA/MB: Textile work can be very pattern-based; a weave is in a sense the architecture of the piece, a structure to build on. But your textile process is almost related to automatism, experimenting with automatic thoughts that arise from one stitch to the next, taking you in many directions. Can you comment on the conceptual side of your process, and the relationship of the mind to the hand? SB: In my approach to weaving and stitching I do improvise, I allow each row of weaving and every stitch to inform the next. It is very much like automatism – I find I am informed by the ritual of the experience, as well as the material and kinaesthetic process. When I weave and stitch I become so absorbed in the process that I am at one with the work, and informed and guided by it as I create. This opens up my imagination and leaves my mind free to explore and respond. When I create in this way I feel that I am grounded in the physical materials and that leaves my mind free to explore, imagine, observe and respond. IOTA/MB: You were awarded a 2014 Governor General’s Award in Visual and Media Arts. In a video produced for this honour, you state that when you are sitting at your loom, you are “Witnessing to life, my life.” If there is a chronology to your process, what is the foundational link between your past work to your present work? SB: The foundational link between my past work to my present work is the improvisational and meditative nature of both. IOTA/MB: What is a notebook keeper? SB: For me, a notebook keeper is someone who loves books-holding them; the left and right layout of them; the intimate scale of them; the tactility of them…AND someone who loves the way you can fill them, put them on a shelf, and begin another, and how they accumulate on your shelf; someone who loves the modesty of them; who loves that they are a kind of mobile studio; and someone who loves the daily ritual of sitting down in a quiet place, opening their notebook and responding there to whatever they are experiencing at that moment. IOTA/MB: What is a tactile book? 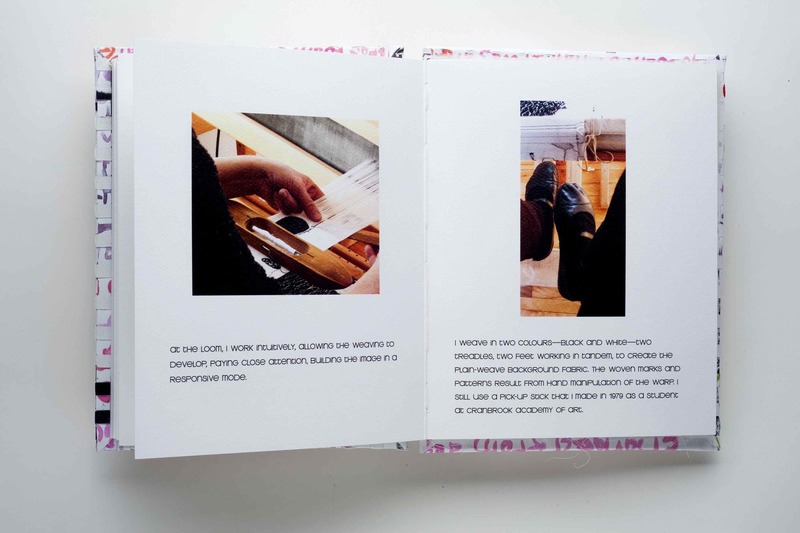 SB: A tactile book is one where the physical properties of the book are enhanced and played with and one in which the notebook keeper enjoys making words and images physical. 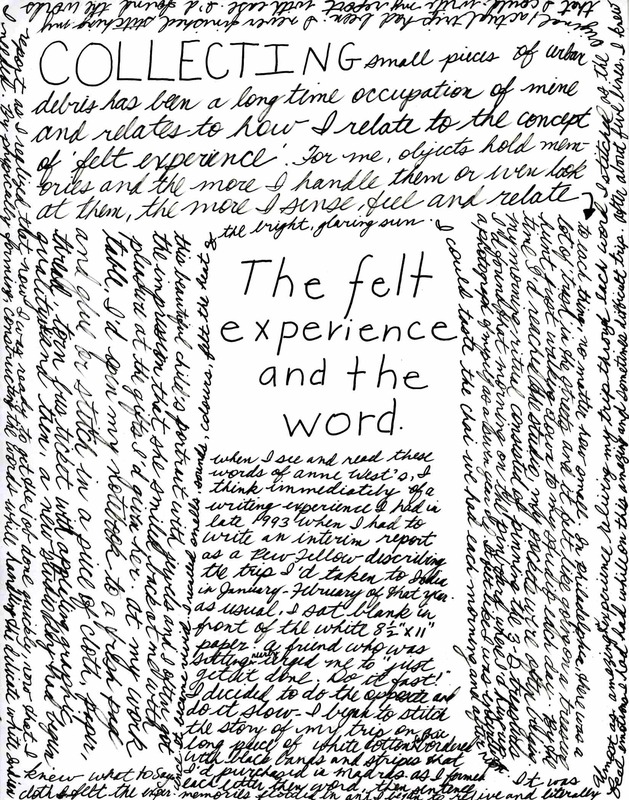 In fact, the tactile approach guides the notebook keeper and enables them to think, reflect, and connect more fully and meaningfully on the page. 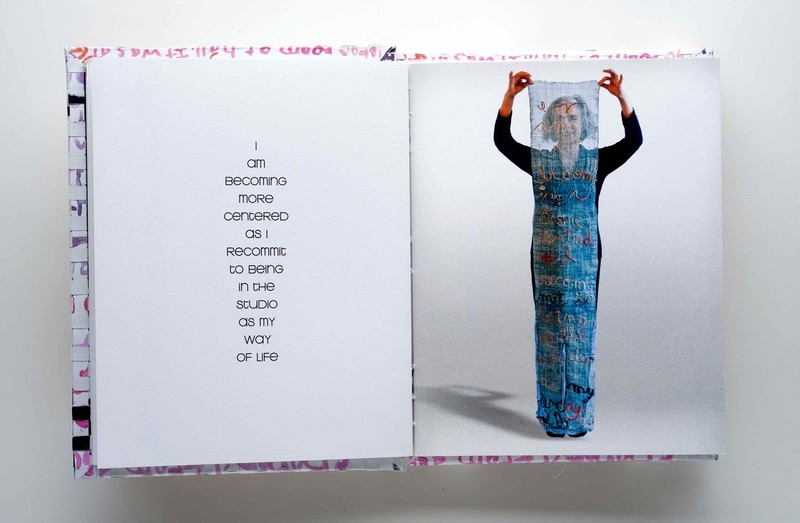 SB: I have the feeling now that I want to return to my loom and weave with my eyes closed (literally)…to be guided by touch and my other senses as I weave and concentrate much more on the physicality of the medium. I think I am ready to experience making in a much more visceral way guided still by my belief in the power that comes from trusting that I will know what action to take as I go along.